Home » iPhone Tips » iPhone Applications » Palringo Instant Messenger Premium Review: Is it Worth Your $4.99? The very reason why I purchased iPhone is communication. Being a writer for years, I have already established close professional relationship with my clients. But on top of that, I have hundreds of friends who communicate with me everyday through Facebook, Yahoo! Messenger, Google Talk, etc… So, my iPhone is really serving its purpose everyday. That’s why it is important for me to have all-in-one chat client to be able to communicate with everybody whatever IM client they are using. 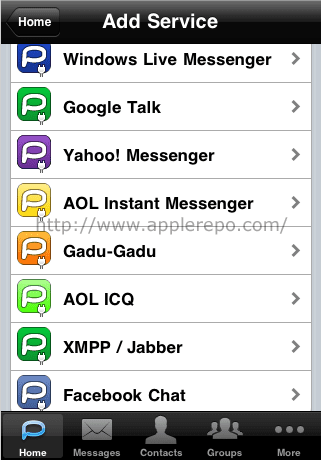 One of the IM clients that I would personally recommend to iPhone users is Palringo Instant Messenger Premium. This app fits my lifestyle so well but it does not mean that it is perfect. There would always be some space for improvements and others may not find it useful than I am. This review is written to honestly provide iPhone users information they need before they’ll purchase this iPhone application. Palringo IM Premium app is built to cater its purpose of existence. It is stable without bugs and is fast to load. Although, you have to create your own Palringo account, it only takes a minute or two. Just after you log into the app, you simply have to add chat services and every time you log into each service, your contacts will appear in your list. It also enables you to send video and audio clips to supported clients such as Windows Live Messenger and Yahoo. speaking of the design, Palringo has a professional look with its sleek and neat design. Moreover, there are also chatrooms you can enter so that you can join a large group of chatters online. You should also know that your contacts are presented to you seamlessly regardless of what platform your friends are using; they will be presented in one big list of contacts. It is not capable of streaming video. Although this may require an extra step for the developer but everybody who uses this app would greatly appreciate it even better if they can stream videos. You cannot change your avatar without visiting Palringo website. For me, it is just a hassle and oftentimes annoying. It would also be nice to have an open microphone option rather than holding the voice icon each time you speak. Technical support can only be attained through the developer’s forum. It would be nice if they will provide their email address to the users. On top of that, Palringo lacks something big. It lacks the support for Skype IM. Although I am hopeful that this feature will be included in the next version, I just can’t believe they missed this one considering that Skype users are more than Yahoo Messenger users. Is Palringo Instant Messenger Premium worth buying for? Yes, it is. If you are like me who needs a reliable medium for communication, then this app is worth your $4.99. There are other clients you can find in iTunes but Palringo may be one of your better options. Considering that it is a feature-packed IM, you will never regret paying for it. I rate this app 8 out of 10.